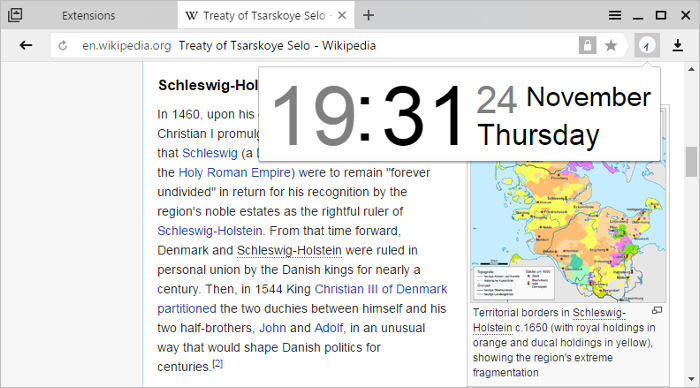 Extensions are small programs that can enhance the browser's functionality. For example, they can block annoying ads, enable night mode or manage passwords. In Yandex Browser, you can install extensions created by the browser's developers as well as extensions from the Opera add-ons catalog. Attention. Unfortunately, there are a lot of malicious extensions since they are not only created by browser developers, but also by third-party programmers. That's why Yandex Browser disables extensions from unverified sources and regularly checks extensions that were installed earlier to verify their authenticity. What extensions are not supported by Yandex Browser? How can I publish an extension in the Yandex Browser catalog? Based on a careful analysis of existing extensions and user preferences, we selected the most popular, useful and secure extensions for Yandex Browser. To open the extensions list, click → Extensions. The page that opens shows the browser extensions you can install. To do this, toggle the button next to the extension name to On. In addition to extensions, the list shows optional browser features (Turbo mode, syncing). In addition to Yandex Browser extensions, you can install Opera adds-ons that are compatible with Yandex Browser. At the bottom of the page, click Yandex Browser Extension Catalog. Go to the page of the extension you want and click +Add to Yandex Browser. In the window that opens, review the list of data that the extension will have access to. If you are willing to allow the extension to access your data, proceed with the installation. Find the extension in the list and toggle the button to On / Off. Click Settings under the description. If there is no such button, then this extension cannot be configured. Restriction. You can only delete extensions that are under From other sources. You can set keyboard shortcuts to quickly activate an extension or perform various actions with it. Click Keyboard shortcuts for extensions at the bottom of the screen. Choose the action that you want to assign a shortcut to and click in the field to the right of it. Press and hold one or more modifier keys (Ctrl, Shift, Alt) and a key of your choice. This extension is malicious and has been black-listed. The extension is not technically compatible with Yandex Browser. The installer says the extension was successfully installed, but it does not appear on the extensions page. The file with the extension. The name of the extension and a description. A link to the project page with additional information about the extension. 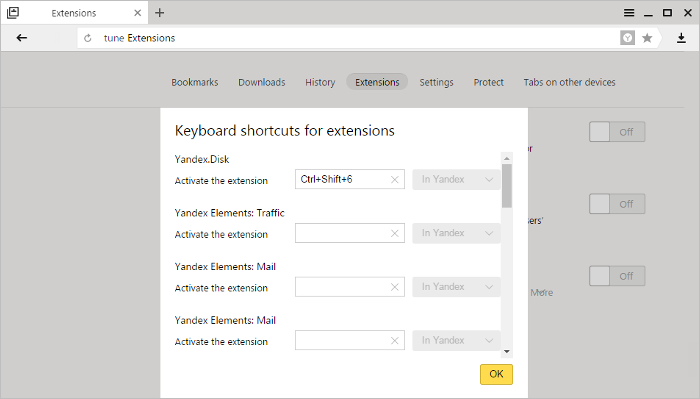 View the list of extensionsActions with extensionsExtension iconSet keyboard shortcuts for extensionsWhat extensions are not supported by Yandex Browser?How can I publish an extension in the Yandex Browser catalog?